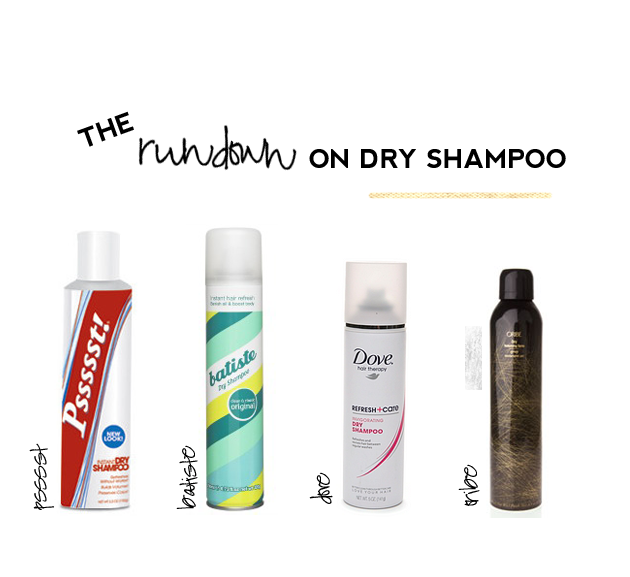 It's no secret I love dry shampoo and am somewhat of a dry shampoo connoisseur if you will. I've written about some of my favorites before but felt it was time for an update and some new reviews. I try to wash my hair every 3 or so days and use a LOT of dry shampoo between washes. The slight exception to this being my darn bangs- I have to wash them everyday and use dry shampoo. #neveragain. I've also been trying different clarifying shampoos every few weeks because while dry shampoo is wonderful, it leaves my scalp needing a good scrub down with a clarifying shampoo. Still trying to find one I love but I'll keep you posted. Let me know if you have any suggestions on a good one to try! I've discovered some new favorites I want to share with you. I've also discovered (the hard way) some not so great options. Let my flat and dirty hair day be your come up. Psssst is my new go-to. It's inexpensive (it's around $7 at CVS) and it goes a long way. And it lasts all day! There is really no need to reapply. I also love that it doesn't leave my hair feeling dry or coated like some other dry shampoos. It also does not have any strong fragrance which is a huge plus in my book. Batiste is still one of my favorites and would probably be my go-to if it was easier to find. I can only seem to find it at Ulta which is pretty far away from me in DC. I've heard people find it at Walgreens and there is always Amazon as well. Batiste works super well. It really makes your hair feel clean again and has a nice light smell. You may need to reapply during the day but it's okay because it doesn't leave your hair feeling coated or dry. I got a sample of Oribe in my Birchbox and I loved it. For my fine hair, this is a great day two dry shampoo or to use if I let my hair air dry. It gives it some oomph, some good texture and doesn't leave your hair falling flat. A lot of dry shampoos just absorb the oil which is for the most part, all I need. What I loved about Oribe was the texturizing part because it gave my hair a little style without much work. The downside? The price tag which is a major downside for me when I consider what I can get for $7.99. Just depends what you're looking for what and what your priorities are! I didn't love the TRESemme Dry Shampoo. You have to spray it in, really massage it in to your scalp and brush it out and sometimes it leaves your hair looking more dirty. It was hard to find the balance of too much vs not enough. And the nozzle clogs really easily. A lot of people love this one but I think there are way better options on the drug store shelf. I like the Not Your Mother's Clean Freak Shampoo alright. Not my favorite but another option that gets the job done. I would NOT recommend Salon Grafix for the same reasons as the TRESemme option. My BFF swears by the Garnier Fructis Dry Shampoo. She has a lot of hair, medium texture and straightens it most days. She is also a brunette. So basically her hair is the opposite of mine and she loves it. So if you fall more closely in that category than the fine blonde hair (like me) category check out her recommendation. I've also heard great great things about the DryBar Detox Dry Shampoo but have not actually tried it myself. If you try it, let me know what you think! Haha yes. You spray and then rub your hands together to create heat and then rub your hands and palms into your roots. Should do the job. I love dry shampoo in theory but in actual practice I haven't found one that I'm attached to yet. I have heard amazing things about Batiste and the DryBar one but I have to try them. I recently bought the Bumble&Bumble one in a trial size and I HATE it. Because it smells awful AND it cost me $21! But I will definitely haul out to Ulta to try the Batiste! I'm a Oscar Biandi girl through and through but I should probably branch out and try some of these inexpensive options. I did once try TRESemme's and I agree that it made my hair feel MORE dirty! I completely agree about TRESemme, not impressed. I grabbed the Dove dry shampoo recently and it's pretty great for $4!